Christie’s Dubai sales exceed market expectations. Christie’s Middle Eastern Sale took place in Dubai on the 19th of March and totalled $8,600,000 against the pre-sale estimates of $4,806,000 and $6,790,000. The sale was divided in two parts following Christie’s strategy over the years with the first half focusing on modern artists and the second part on less established, contemporary talents. 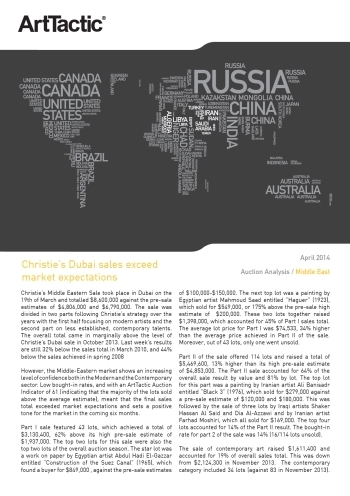 The overall total came in marginally above the level of Christie’s Dubai sale in October 2013. Last week’s results are still 32% below the sales total in March 2010, and 44% below the sales achieved in spring 2008.